Circa 1930. 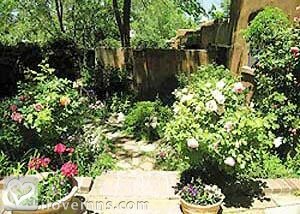 Winner - 2018 Top 10 Most Romantic Inn - Tranquility surrounds Hacienda Nicholas, a historic Santa Fe B&B inn that boasts eco-friendly lodging in New Mexico. Experience the extreme comfort and modern conveniences with a minimal environmental impact. 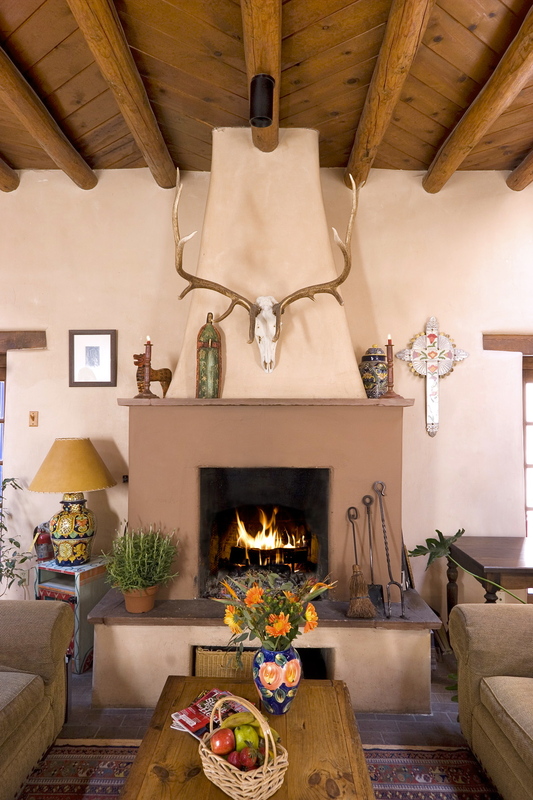 Thick Adobe walls and an interior courtyard provide a quiet, peaceful retreat. Guest rooms feature upscale amenities for total relaxation and pampering. 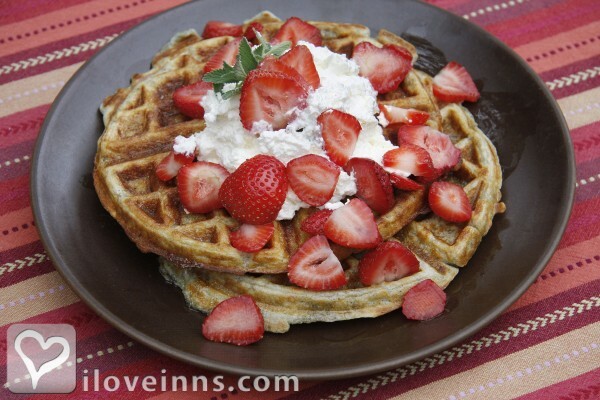 Linger over an organic breakfast that includes vegetarian options. Indulge in homemade treats served at teatime and gather for the fireside wine and cheese hour. 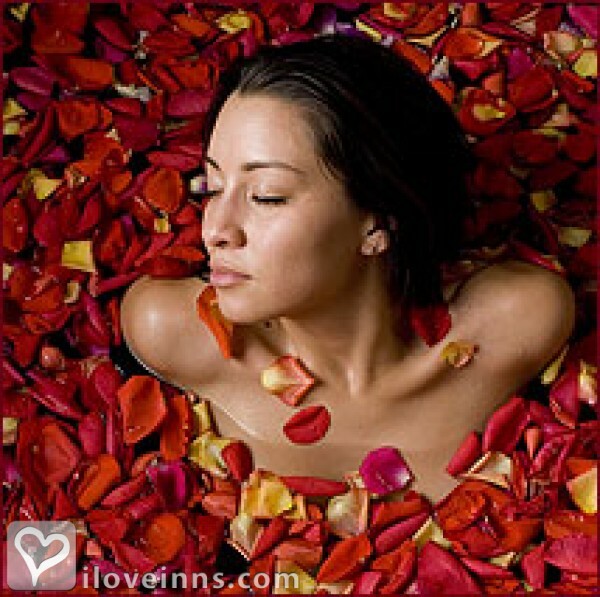 The inn's luxurious Absolute Nirvana Spa in the back garden offers Asian spa rituals, rose petal baths and a selection of massages and facials. Ask about special packages available. Fitness privileges are offered at the El Gaucho Health Club. 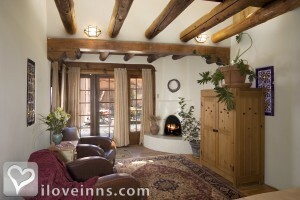 This property has 11 total guest accommodations, 7 with private bath, 3 with fireplaces, 3 suites and 1 conference room. The types of beds available include Queen and King. Spa, Corporate Gym Membership to El Gancho, in-room phone with voice mail, early continental breakfast upon special request. Four-poster draped queen bed, light and sunny room in main building. Large private bath with tub/shower and great Mexican tile. 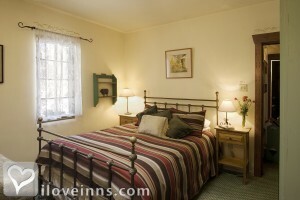 Smaller room with wrought iron bed, stenciling, private bath with shower only. Located in main building, sunny room. 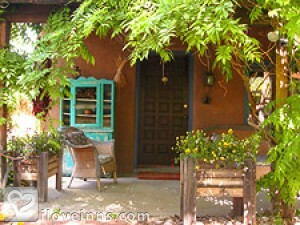 Wrought iron bed, love seat in sitting area, stenciling, dried flowers, private bath with Mexican tile, tub/shower. Located in main building. 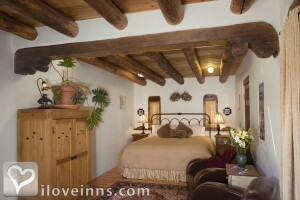 Wrought iron bed, stenciling, private bath with vintage Mexican tile. Located in main building, sunny. 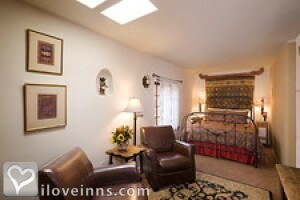 Bedroom has wrought iron bed, large living room with fireplace and ample seating. Private room off garden courtyard and bath has tub/shower and Mexican tile. 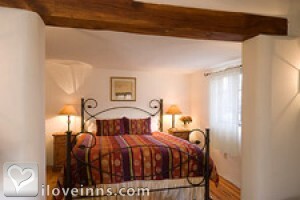 Wrought iron bed in large bedroom with kiva fireplace, off garden courtyard. Large bath with tub/shower is handicap accessible. 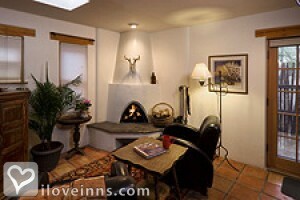 King bed (2nd floor - spiral stairs), sitting room with kiva fireplace and kitchenette, evaporative cooler, private bath (1st floor), cable tv, wi-fi, iPod Speakers & phone. 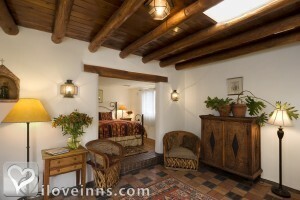 The Casita is actually one of four Alexander's Inn Vacation Rentals, though Casita guests are invited to join us at the Hacienda Nicholas for breakfast and the evening Social Hour. Queen bed (second floor - spiral stairs), living room with kiva fireplace, full kitchen, evaporative cooler, private bath (1st floor),cable tv, wi-fi, iPod speakers & phone. The Cottage is actually one of four Alexander's Inn Vacation Rentals, though Cottage guests are invited to join us at the Hacienda Nicholas for breakfast and the evening Social Hour. The dates this property will honor the certificate are Nov. 1-Feb. 28, Sunday-Thursday, no holidays. Fabulous, so cozy, so friendly! The best spa in the country! So nice to be in a dream world for a couple of days. 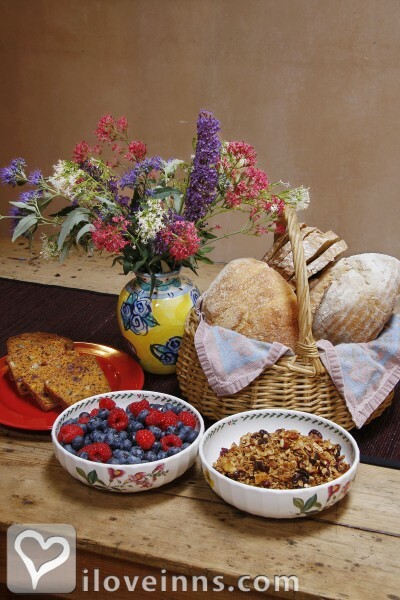 Delicious breakfasts! This was our fifth visit to Hacienda Nicholas. We keep coming back for the warm, gracious and friendly hospitality, the tasty breakfasts, the convenient location and all the great guests we meet each time. 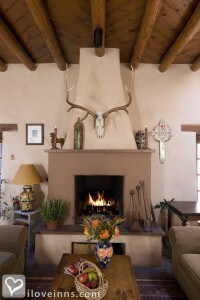 This place is truly a Santa Fe treasure! A very relaxing experience. 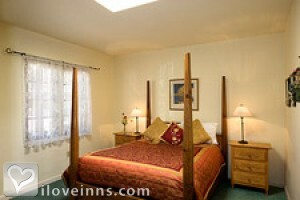 This place is very comfortable and convenient to local attractions. Starting the day with fantastic breakfasts and lots of helpful advice, comfortable rooms, great southwestern decor and feeling, and an amazing spa. Couldn't ask for a better getaway! Thank you! Lucky us - room to stay another day! 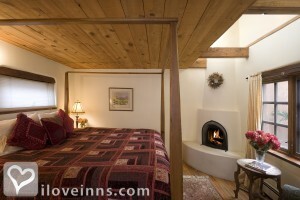 Our thanks for making our introduction to Santa Fe so wonderful. Great breakfasts that kept us going half the day. A real treat to stay in this hacienda and special thanks to Merrilee and Regan and all the others who sent us in the right directions. This was our third visit to Hacienda Nicholas from New Jersey. We came back for our 25th Anniversary and found it as charming as the first time! Nice fluffy bed, great breakfasts, superb service. Thank you for all you did for us during our stay. We were so well looked-after and made to feel special. We stayed over an extra two nights and didn't want to leave. Everyone was so very helpful and the food was amazing. Great location too! 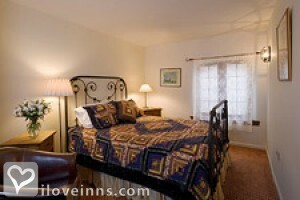 What a great place with such lovely, helpful, attentive innkeepers! Great food and excellent accommodations all around. 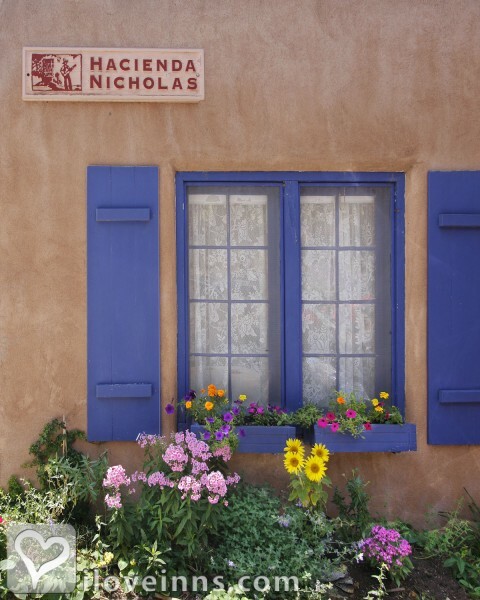 We will definitely recommend Hacienda Nicholas to anyone coming to Santa Fe from our neck of the woods. This was a wonderful choice for us. The staff were helpful and made us feel as though we were all family. The breakfasts and cookies were amazing - we would definitely recommend and return. Thank you! Thank you so much for your hospitality and kindness during our evacuation from Los Alamos. You are all wonderful! We appreciated having such a warm and homey environment during such a trying time for us. We will recommend you far and wide. Thank you so much for our second lovely stay - we could live here! Carolyn and her entire staff are beyond helpful and hospitable. We shall return! Our first trip to Santa Fe has been a delight. The Hacienda is so warm and inviting. Greg's jams are wonderful, the conversations with other guests entertaining, and the room magical (especially love the fireplace!). We hope to return soon. Thank you for a wonderful stay! I love this place! The breakfast was great, the bed was comfy and the service was the best. You really made my first visit to New Mexico. It was a great escape from the big city! This was our fourth visit and the best one yet! It's not just the wonderful food, but also the friendly people who work at Hacienda Nicholas. You're the best! Thanks for making a group of Southern Ladies happy - not always very easy! We enjoyed our stay, the yummy breakfasts and having such a friendly staff who went above and beyond to take such good care of us. Ya'll were precious to us! Thank you for the wonderful visit. We loved our room, the breakfast and the afternoon social hour. Everyone was so helpful with info about what to do, where to eat, how to get there. Really made the stay exceptional. Wow! What a special place! I have truly never been anywhere like it. The ambiance, the charm, the people, the food! Best sleep of the whole vacation. Thank you for an amazing three days. I can't wait to come back! This has been another beautiful stay at Hacienda Nicholas...this just may become a yearly tradition! The kindness and generosity of spirit from all is a delightful experience for us both. We enjoyed staying here so much. 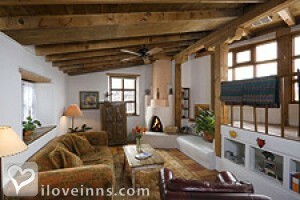 It's close to the Plaza, very cozy and hospitable. We loved our room (the fireplace made it the perfect choice). Breakfast was marvelous. All were wonderful and were extremely helpful during a family medical emergency.